It may sound strange, but there was a family of fish, who lived in a home, directly beneath my home. The father fish – of that’s he is called – was Theodore. Surreal, haunting and very beautiful. Wonderful color as well! Happy to see you smiling, Yoshizen! I guess it’s a little eerie. It’s interesting to hear how others perceive images, I’m glad you find it delightful, Kat! I’m happy you think so, Scott. Thank you. Beautiful, ethereal, evocative..in short, I LOVE it! Oh my… This is nice composition Karen! I see something like a flood. Thanks very much, Meho, I’m glad you like my absurd art! I really enjoy the creativity of your vision and processing, Karen. Thank you, Steve, I’m glad you do! (Annie Proulx) – it would make a perfect movie poster… 😉 great image! Surreal and mysterious – amazing image, Karen! That is a fabulous image. Straight out of a fairy tale. I just stared, and stared. Gorgeous. What a great response, Ziggy, I love it! Thank you very much. Beautiful combination of images and great photoshopping. Your imagination in seeing the final image is amazing. Thank you, Lee. I’m not sure that I have that much insight for the final image., something just compels me to keep working and then it somehow comes together. It’s such a fun process and often surprising! Hi Steven, yes it’s a bit mysterious how the reflection is clearer than the actual structure. Things don’t always make sense. Thanks for your insightful comments, I’m happy you like it. Hi Karen, I didn’t know whether it was deliberate or not. I found it a beautiful aspect to a beautiful image. thanks for your reply. It sort of worked out that way as I was processing and then I liked the idea of the reflection revealing more than the ‘actual’. Yes, I wonder what happens next!? Such a lovely comment, Kathleen, thanks so much! Sometimes I wonder about these wonky ideas I come up with… and yet… they just keep coming from somewhere. Thanks for your comment, Lee, I’m pleased you like it. Yes, I think it was Huckleberry Finn that was floating along on that raft. Perhaps it’s the stripped-back structure that brings a raft to mind. Superb Karen. I love the sureal nature of this picture! My first thought seeing this was ‘Noah’s Ark’ – it has such a sense of impossible other worldliness, floating away. It’s beautiful Karen. That’s interesting that you say that about ‘Noah’s Ark’ – it occurred to me too, although it was not referenced in an intentional way. But there is a flood, an ark-like structure and 2 fishes… hmm. Thanks for your comments, Anna! This one just jumped out at me. Superb Karen. Thanks so much, David, I’m pleased with this too. I’m really happy it resonated with you. Thanks for your thoughts, I’m happy you stopped by. Beautiful use of color and compositing to create another mysterious image Karen. I really enjoy this image though the fish on top is a little disconcerting. I find myself wanting to remove that one yet leave the lower one in; but, as you say, “things don’t always make sense”. Hi Nick, thanks for leaving you thoughts regarding this image. One fish, two fish, red fish, blue fish…? Karen, your fantasy is limitless. Never know what is the next coming out from you camera and computer. This last project is awesome! Oh, I’m so glad you enjoy this type of image, Alexander! It’s a tremendous amount of fun working on this project. A truth within a lie, perhaps…? Doesn’t have to make sense to make magic. Wonderful work, Karen. I’m glad you think so, Bente! Thanks very much. Thank you, Emily. I think we are both in love with layering images. Wonderfully surreal. Sets off the imagination. I love the skin of the image – so delicate and precise – it emphasises the hopeless deadness of the poor fish. Beautiful image! Very cool, surreal shot & production. Nice work Karen. you just keep hitting it out of the park. A clever illustration with a lovely feel for decay. It did turn out quite illustrative, which in this case I think I like. Thanks fro your comment, John. I’m wild about this piece! 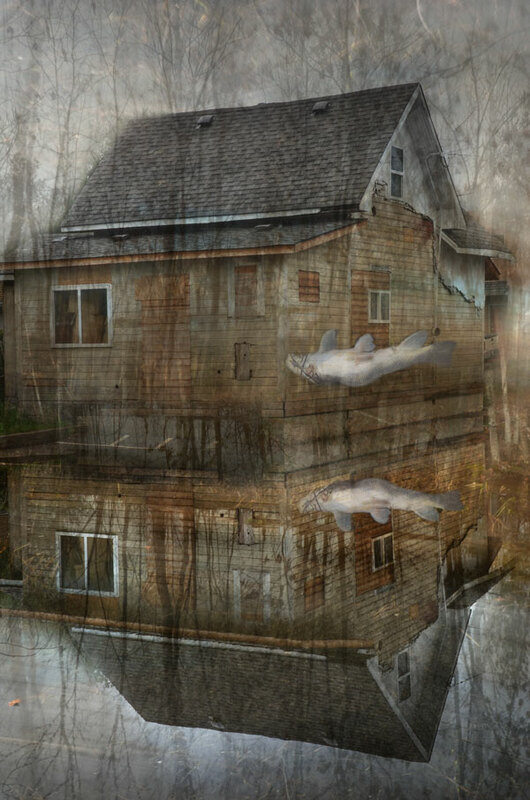 Many great loves of mine combined into one spectacular artwork: fish, derelict/rustic buildings, ghost or mystery stories, digital fantasias…. I adore it. Fabulous!!! Yay! I’m thrilled you respond to it so much, Kathryn. WoW! This is for me magic! And the picture do me HAPPY 🙂 Maybee, because it surprise me.. Good work, Karen! Thanks so much, Gro! : ) Magic is good. So interesting, so mysterious, just captivating! Beautiful image, Surreal and evocative. Wonderfully creative and surreal, Karen! Some of your readers seem to find the “flying” fish disconcerting; I love it and I think it really adds mystery and magic to the picture. This image calls for a story – but you probably have one. With this blogger she shows people through the effects on the photo what it was like taking the image. What it felt like standing in that location in the middle of nowhere. Strange, however it relate to the reality within photography. Showing the audience what the place was like makes you feel you are there, that is reality. Making a scene look like what is feels like rather than just taking a plain photo of the house. Wonderful surreal image … so creative and beautifully done. I can’t decide if I like this image or not.. hmmmm .. I love the tones and reflective quality that’s for sure.. but the fish ? No it doesn’t work for me.. Gosh did I say that about one of your pices of work karen… that’s a first for sure !.. The title certainly makes sense ! Absolutely stunning, it’s like a beautiful surreal dream with all the possibilities which are not possible in real life! Amazing and in my head it certainly makes sense, I share your vision, love your imagination and appreciate your creativity! Thank you very much for all your generous comments, Robert. I’m happy you like this! I wonder, just how many times do we overlook the most enchanting and surreal of things in our mundane existences. Its good that someone is taking out time to share these wonders with us.